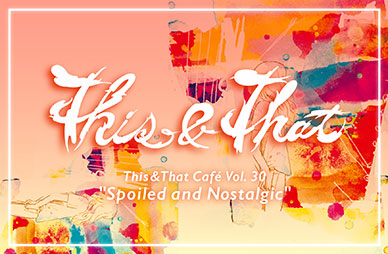 In addition to our customary eclectic array of live music, live art and various digital diversions, This&That Cafe Vol. 30 also celebrates the release of “Spoiled and Nostalgic,” a new EP by our good friends and Tokyo-based alt-rock band The Watanabes. With the help of some old friends as well as new artistic acquaintances, this promises to be an unforgettable night! The Watanabes are two British brothers in Tokyo doing it the indie way; sharing a room together, sipping on green tea while writing heartfelt pop tunes on second hand guitars. They perform both as an acoustic duo, or as a band with Ayumi Sato on bass and Tomoyuki Yamada on drums. The group have been performing and recording in Japan since 2005 and have released three albums at major Japanese record stores nationwide. Their songs have appeared on TV, and received airplay on national radio both in the UK and in Japan, and they’ve made some notable fans along the way, including Academy Award winner Ric O’Barry, 60’s legend, Dave Crosby, and Matt Sorum of Guns N Roses, who they performed alongside in August 2013. Jimmy Binks and the Shakehorns is an international alternative-country band based in Tokyo. Their style has been variously described as alternative-country, Americana, folk, roots, bluegrass and acoustic rock. The current lineup came together in 2014 in Tokyo, and after well-received summer festival appearances, have been tipped to make inroads in the Japanese music scene. Their debut album “The Good Life” was released nationwide in Japan in September 2016. Combining the varying influences of its 3 members, ENTRADA bring pop sensibilities, passion and style that rise above its core elements. Soaring vocals, energetic riffing, measured synth and dynamic drumming create a uniquely British sound in the heart of Tokyo. Kate Beck is a singer /songwriter from California living and performing in Tokyo. Though she grew up playing classical violin and later picked up the guitar, for most of her life Kate mainly wrote and performed songs only to her family and close friends. She got up on a Tokyo stage a year ago and has been playing stages and singing in commercials across Tokyo since. Accompanied by personal anecdotes and often interacting with her audience, her live shows still retain the feel of freshness and intimacy that they did back when she played for her family and friends. Influenced by the American roots music she heard in growing up, Kate’s music combines elements of folk, blues, and country with deeply personal and original lyrics. Born in 1988, Tokyo, Japan. 2009-2013 Musashino Art University, Tokyo JP (BA Fine Art, Printmaking) Currently Lives and works in Tokyo, Japan. Ayaka Nakamura uses mostly hand-drawn images to create woodblocks, animation and music videos. Her delicate yet strong visuals have earned her strong reputation both at home and abroad. Born and raised in Kanagawa, Mari Asada graduated from Tama Art University, majoring in Graphic Design. While still in university studying Graphic Communication Design, she helped in the production of a party called ‘Life Force’ organized by her own father who is a sound engineer. After witnessing the process of integrating music, video, lights and art in the Japan party scene, Asada was inspired to pursue film as a ‘time art’ projected into space. She later formed the visual unit ‘Interstella’ and her career has been on the rise ever since. By projecting video hat synchronizes with music, she creates a space for community where people could share and experience things together, in a process that would ultimately shed light into their unconsciousness.Presently, in addition to her studies in Digital Content Management at Digital Hollywood Graduate School, she currently goes by the name ‘marimosphere’ and works in many fields including VJing, project mapping and interactive media art performance. Take the perfect selfie within seconds and instantly share with friends through social media!